Find links to everything above by clicking here! The best part of my September has been spent delving into the amaze new trends for the upcoming season and goggling all of the dreamy Fashion Week catwalk designs, in particular Gucci and Ryan Lo - dreeeeeeeaaaaaaaamy or whaaaa? 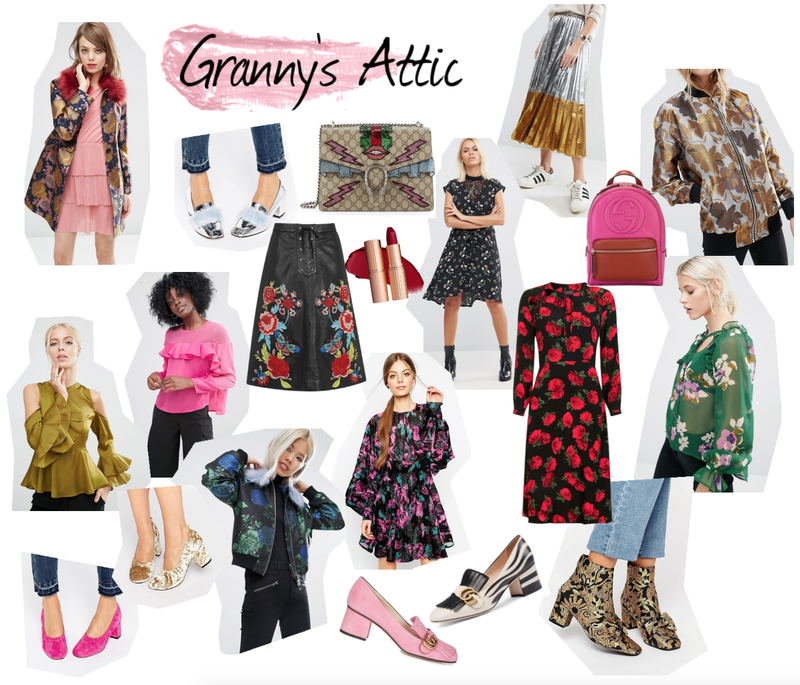 After doing a bit of online shopping - umm, research* ofc - I've come across 4 main trends that stand loud and proud within the Autumn/Winter season, starting with my absolute FAVE, 'Granny's Attic'. We all have a wacky Granny, or know someone who has, who goes above and beyond in their day-to-day appearance, cramming all the vintage pearls, frilly jumpers and printed trousers into one eye-catching look, which is exactly where the inspiration for this bombshell comes from. An absolute mish-mash of all things bright, bold and colourful combined with a playful mix of textures and prints. Put 'em all together and BAM! You've got yourself this bladdy fabulous trend. With my wardrobe now being a satisfactory array of such things, I'm pretty chuffed with this trend to say the least, but I'll grab any excuse to go on an extravagant shopping spree, especially one as wild as this! Above are my picks from both the high street and a few of my favourite designers of some key bits to add to your A/W wardrobe to absolutely nail this trend. I'll be back over the next month covering the other killer trends for the season and of course, more shopping inspo for you guys. I already have my Christmas list in the making!